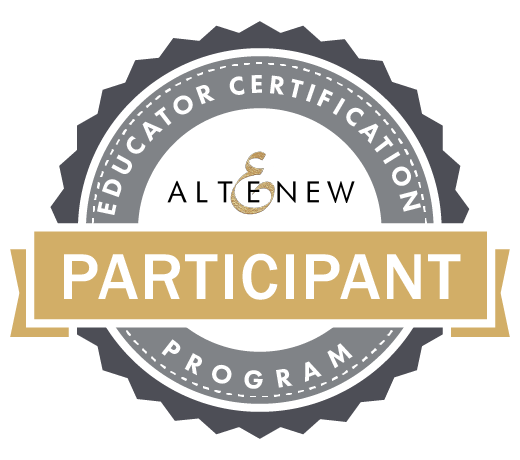 I believe I’ve taken every class Altenew Academy offers! Luckily, a new class is starting today in Creative Coloring with Artist Markers and I am looking forward to that one. I’ve gotten so much out of all of the other classes that I just can’t wait to take more! 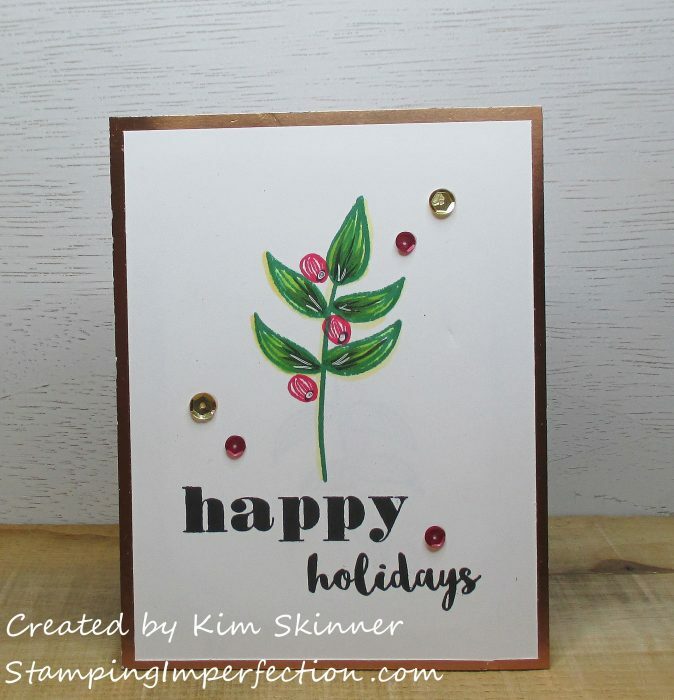 The cards that I’m sharing today are for the Last Minute Holiday Cards class. I liked this class because it really was about creating quick cards with what you have in your stash. I just got one holiday stamp set from Altenew that has no sentiments in it. I have no holiday stamp sets with sentiments! I liked that the instructor challenged us to look at the stamp sets that we do have and imagine how we might use them to create holiday cards. Two of the cards that I’m sharing today are really my version of CASEd cards from the lessons and one card that is my own layout with ideas from the class. I will share that one first. It is my favorite of the 3. I have a video which I will share later to show you the details of this card. 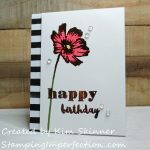 I used the Altenew Freeform Greenery stamp set along with the Stunning Cosmos stamp set for the sentiment. I’ve added some copper embossing and copper foil along with some sequins and some sketchy hand drawn details. 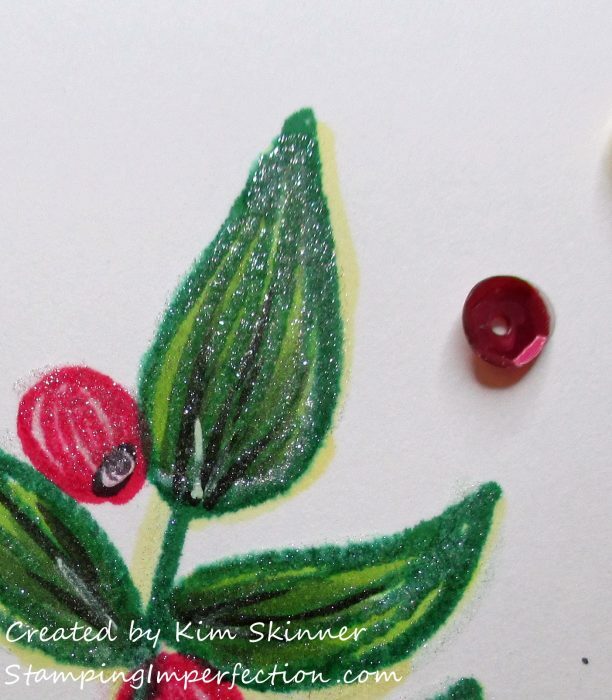 I stamped the leaves 4 times and added a bunch of the berry images. I used Moss and Ruby Red inks. Then I grabbed by Altenew Artist Markers and used the flicking technique to fill in the leaves. I used a fine tip brush sharpie in black to add some sketchy details and then added some details with a white gel pen. I added some copper embossed dots with my Versa Marker. This was a detail that the instructor added on a lot of her cards and I like that it is imperfect and random. The sequins are from the Neat &Tangled Jewel Mix just for a bit more color. The stamped panel is cut 3-3/4 x 5-1/2″ so I could leave a little white above it and add the copper below it. The panel is popped up on foam tape to add dimension to the card. 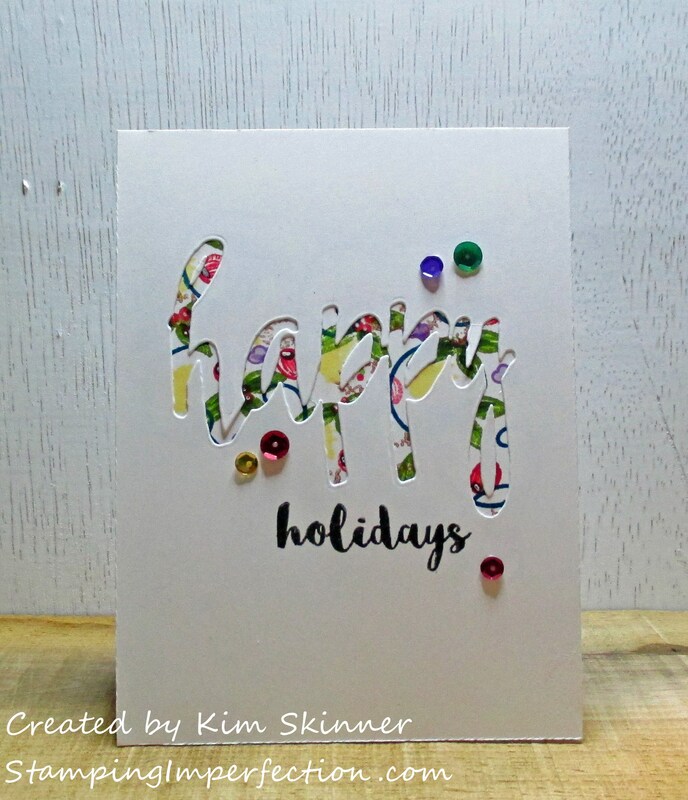 This is a non-holiday stamp set used to create a really quick holiday card. These would be easy to mass produce in a pinch. This was actually the first card that I created and I didn’t love it. It felt flat. I liked it better after I added the sketchy details with the sharpie and gel pen. I think that I would also either heat emboss the sentiment next time or put one of them on a separate strip of card stock and pop it up with foam tape. I like dimension on my card, although this is quite mailable. I think the copper foil helps to make it feel more festive. I also liked it better when I added the NUVO shimmer pen. A little shimmer makes everything better! You can also see the marker detail I added. I also used a light yellow Artist Marker to add a “shadow” outline around the leaves and the stem hoping to make it pop off the card more. The last card uses the Altenew Halftone Happy die and I stamped random small images in holiday colors below the die cut on the card base. I’m wishing I added more red and another green to make it feel a bit more Christmas like. 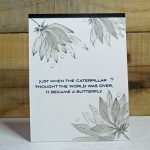 This is very quick to create and I like the effect you get from stamping below the die cut sentiment. I will definitely be working on this technique! I love those jewel sequins. Can you tell? I’ve used them on so many cards lately. Those deep jewel tones are the colors that I’ve decorated my entire house in and they just feel like home to me. Those are the colors and tones that make my soul sing when I see them! What stamp sets do you have in your stash that you might be able to use for the holiday season? I love the idea of stretching my supplies and using them in new ways. I love that we can stretch our craft budgets by using our tools and supplies in new and creative ways. Challenge yourself to look at your stash with fresh eyes and see what you can come up with! Thank you so much for stopping by! 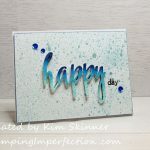 Happy crafting and remember to embrace the imperfections and if all else fails, add some shimmer pen and sequins in your favorite colors! I love how you used your non-Christmas/holiday stamps!! these are AWESOME and DELIGHTFUL Christmas/holiday cards, Kim! !